Built back in the summer of 2007, it didn’t take long for Aqua Midtown to be the talk the market. Originally compared to something you’d ordinarily see down in South Beach, Aqua Midtown condos for sale are sleek, stylish, modern, and sophisticated, providing residents with just about everything you could want in a big city high-rise. Fronting 10th Street right in the heart of Midtown, the Aqua condo building in Atlanta is hard to miss with its sleek glass exterior and absolutely gorgeous design. Most condos for sale inside Aqua Midtown boast exceptions city views, not to mention a full slate of highly upgraded interiors, which include high ceilings with floor-to-ceiling windows, high-efficiency windows, exotic hardwood flooring, premium Viking kitchen appliances, European style cabinetry, granite countertops, and master bathrooms that are best as described as spa-quality. 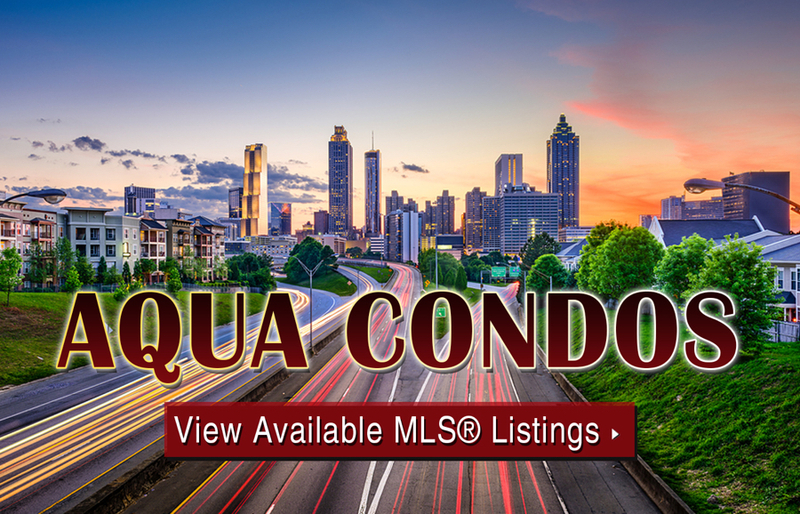 If you’d like more information about Aqua Midtown condos for sale in Atlanta, call us today at (404) 564-7272, or click below to start browsing active listings at this amazing Midtown condo development. If you think the building itself makes living in Aqua Atlanta attractive, consider the fact that you’ll also be well with walking distance to so many neighborhood amenities and attractions. On the ground level within the building is 3,400 square feet of retail space, and once walking outside the front lobby doors, you’ll be greeted with all sorts of shopping, dining, and entertainment in almost every single direction. For a closer look at what’s near condos for sale at Aqua Midtown, check out the map below. Can’t find what you’re looking for at Aqua Midtown? Start browsing other Midtown real estate for sale or give the Zac Team a call at (404) 564-7272 for help with your new home or condo search today!